Most designers love organza for its sheer quality and crisp texture. Wedding dresses are the most common recipient of this fabric as it creates elegance and glamour with its fabric characteristics. Here are some of the best silk organza wedding dresses designs you can find and choose the right style for your very special occasion. Image 1 shows classic elegance of luxe silk organza. This pretty ball gown with its hemline on floor length is adored with stylish ribbon and detachable flower broach highlights. A full A-line skirt with sweetheart rushed bodice, it is best for church, garden and outdoor wedding themes. Image 2 is a washed silk organza wedding dress. With lace bodice and tiered organza ruffled skirt, its mermaid silhouette just give the impression of style and elegance summed in this perfect gown. 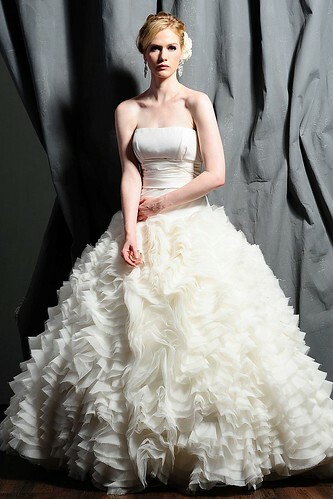 Image 3 is a sensational modern ball gown defined by its silk organza ruffled skirt. 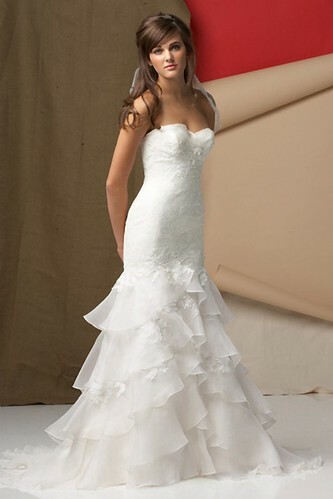 With hand-ruched strapless empire waist bodice, this wedding dress is finished with small chapel train look. There are still other silk organza wedding dresses you could choose from for your special day, find the perfect style that defines your body and spells your personality. This entry was posted on Thursday, August 30th, 2012 at 3:05 am and is filed under Fabrics Blog. You can follow any responses to this entry through the RSS 2.0 feed. You can leave a response, or trackback from your own site.